UX2 provides the lowest noise for recording guitar with 12dB more dynamic range than similar interfaces. POD Farm plug-in provides 18 guitar amps, 24 guitar cabs, 5 bass amps and 5 bass cabs, 29 essential stompbox & studio effects . 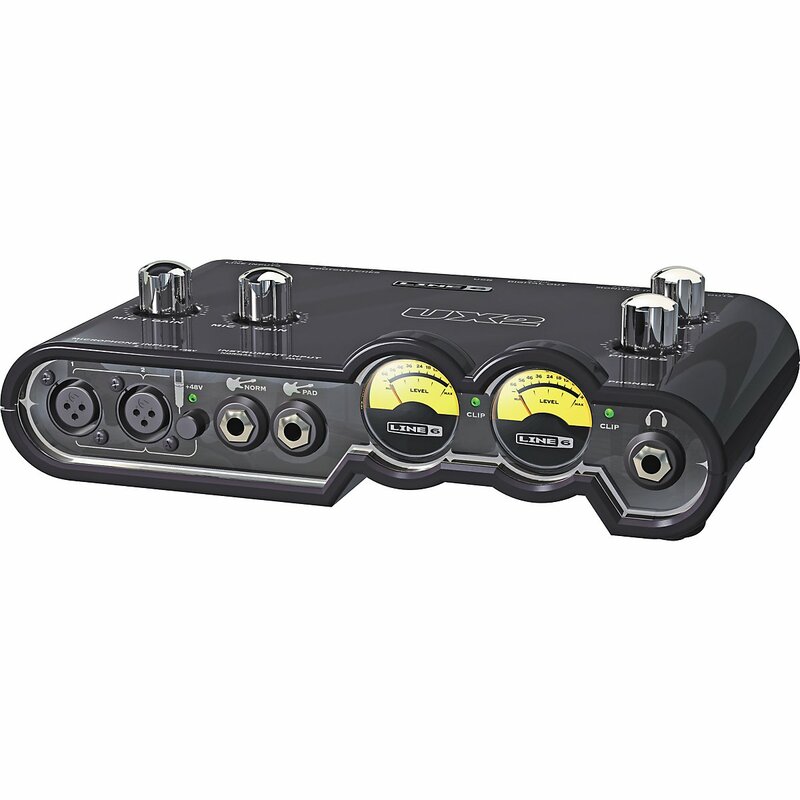 Two 1/4-inch guitar inputs,two balanced XLR inputs with mic preamps,phantom power and trim knobs. POD® Studio UX2: Pro Guitar Recording with Superior POD® Tone POD® Studio UX2 combines the stunning sound of POD Farm™ plug-in with a rock-solid and powerful USB interface. Essential to the success of countless platinum-selling albums, these immortal Line 6 guitar, bass and effects tones are now available for recording guitarists. POD Farm, the Premium Tone Plug-in POD Farm plug-in features the sounds of the sought-after vintage essentials and must-have modern monsters necessary for a pro-sounding recording. It includes 18 immortal guitar amps (modeled after* Fender® Deluxe Reverb®, Marshall® JCM-800, Vox® AC-30 Top Boost, Mesa/Boogie® Dual Rectifier®, and more), 24 guitar cabs, 5 bass amps and 5 bass cabs, 29 essential stompbox and studio effects (modeled after* EP-1 Tube Echoplex, Ibanez® Tube Screamer®, MXR® Phase 90, LA-2A® studio compression, and more) and 6 crucial mic preamps (modeled after* Neve® 1073, Avalon Vt737, API® 512c, and more). Drag and drop models into the signal flow, pre or post amplifier. The carousel-style gear browser, displaying each and every coveted model, provides an experience that’s a dream come true. Creating classic tones or imaginative hybrids is incredibly fast and easy. Plus, get your free FX Junkie model pack and add 35 more effect models. UX2, the Lowest Noise for the Clearest Recordings UX2 boasts the lowest noise for recording guitar, 12dB more dynamic range than similar interfaces, for clear and dynamic recordings. Plus, exclusive Line 6 ToneDirect™ monitoring virtually eliminates latency allowing you to record with amp and effect modeling and without sacrificing tone or feel. Start Recording Right Out of the Box POD Studio UX2 includes POD Farm plug-in, Ableton® Live Lite Line 6 Studio Edition 16-track recording software ideal for guitarists, and award-winning Reason Adapted production software featuring a sought-after sequencer and tons of stunningly lifelike instruments.